My so-called baby in the house will turn 8 in August. This little spark plug is the life of our house. She makes all the sounds that filled our house and energize the house day in and day out. Last year she tried out for the town travelling team and made it to the U8 soccer team. She was excited about the opportunity. By all accounts she enjoyed the first half of the season playing left forward and even scored the winning goal for their first win of the season. The win was a come-from-behind win. I was so proud of the team because they fell behind quickly, down 0-2, and came from behind to win 3-2. During the second half of the season, the coach decided to shuffle things up. She started playing defense, but did not know what to do. There were numerous games she came home lamenting that she did not know what to do. I do understand and support the coach’s decision to play her on defense, because I believe that will allow her to be well rounded. But without the proper instructions, it will really frustrate the child as they cannot cope with the situation. As the season was about to end, all the players needed to try out for the next season. Due to her piano recital she was able to attend one of the two tryout sessions. But she was confident that she made the B team as there won’t be an A team this coming season. She told me that she would definitely be in one of the two B teams. As a parent, we saw her play and believed that she would make the B team. When the tryout results came out, she was assigned to the C team, which was the developmental team. That night I could not sleep as I had to figure out the best way to break the news to her. I’ve done performance review discussions many times delivering bad news, but for some reason this was tougher. When I broke the news to her, she cried her heart out. She asked why she was on the C team. I told her that sometimes in life we don’t get what we want. I made her promise not to quit and get back in the saddle and get the job done. 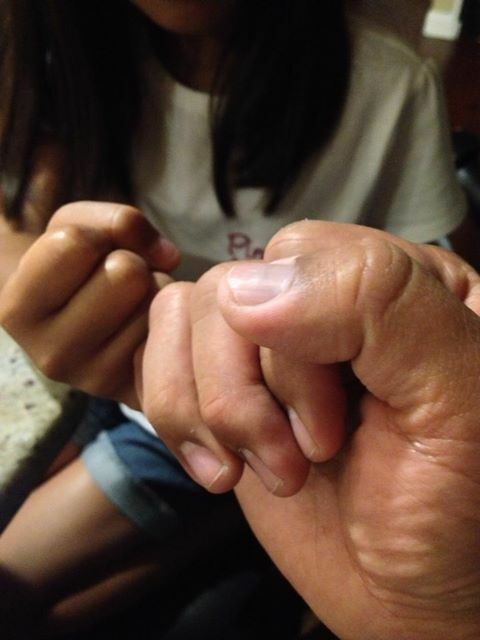 A pinky promise made between a daddy and Maddy to encourage her to continue this journey. I told her that she needs prove to those who doubt her that she is capable of making the upper level team. 1) Success – described her goal that won the 1st game of the season. I want her to know that she is capable of getting the job done. 2) You don’t get what you want at times – it is important that she learn the lesson that sometimes we don’t get what we want. We can say life is not fair, but it does not mean that we should give up. 3) Continue to work hard – the approach to life is 100% or nothing. Either you put everything on the line or you don’t do it. There is no shortcut and slowdown. If you want something, you need to put in the time effort and commitment to get the job done. 4) Being honest with her – telling her the true situation versus sugar coating it. I told her that the C team is a developmental team. It is best that she knows that now, because she would notice that when the season started. There was no point hiding the truth from her. However, it is important to encourage her to take this as an opportunity to demonstrate her capabilities. 5) Give her the time to deal with it – provide a supportive environment and give her the time to deal with the situation, but talk to her and let her tell you what’s on her mind. It might take days, months to get through it, but we’re committed to be there for her. It will be a long summer before the soccer season starts. She has a year to prove her capability. We talked about making a commitment and making the most of the opportunity. I’m sure this lesson will make her stronger and will serve her well. The future will be bright. Torpedoes Black team, here comes Maddy!